We believe that every maker will come to a point in their crafting journey that they have to choose between giving up or taking that leap of faith. 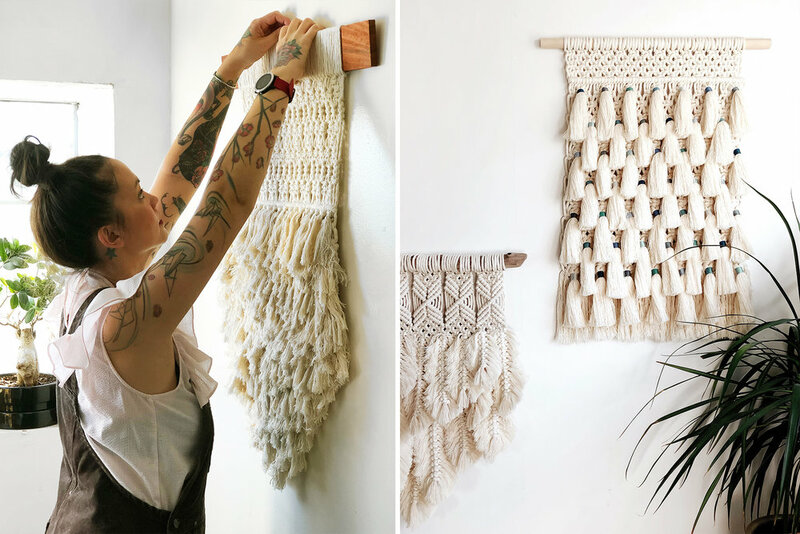 For fiber artist, Maya Slininger, she had to choose between staying at her full time job as a visual merchandiser or taking her fiber art business, juniper + fir to the next level. And she chose the latter! With that decision, she now wakes up every morning feeling happy that she can create something with her own hands, and to her that beats any day job. We spoke with this brave soul on her journey to realising her dream job. Read on for wise advice from her! Early riser or night owl… Both! I know its super terrible, but I stay up late working and then wake up around 7am bright eyed and bushy tailed. What did you aspire to be when you were 5… I can’t really recall what I wanted to be at that age. But, if I had to guess, I most likely wanted be a movie star, or Hello Kitty. 3 essentials we can find in your bag… Chapstick, bobby pins, and ibuprofen. If you weren’t a macramé artist, you would most likely be doing... I’d most likely be working as a Set Dresser or Set Decorator in film/TV. This is something I already do occasionally and it enables me to utilize my visual/artistic skills. 1. Tell us about your background and what led to you choosing fiber art as a craft. I’ve always made things with my hands, and have been creatively inclined. When I was young I would draw, and make little arts & crafts projects. If it had to do anything with scissors and glue, I was in! I think things really took off for me when I took my first sewing class in junior high school. After that, I continued to sew and make small gifts, clothes, and plush animals. I never thought of any of those projects as something I would want to continue with. They were all just for fun. I had always been infatuated with architecture, interior design, and furniture so I think I was just naturally led to this direction. I spent 12 years working in the visual merchandising field and learned so much about color, balance, and space. Naturally, I took what I had learned and combined it with my interests. When I just started I was still working a full-time job. However, what started off as a side project became much bigger than I expected. At that point I could no longer do both, and had to make the decision to either stay at my day job and scale back juniper + fir, or take a leap, quit, and cross my fingers that was what I was more passionate about and that it would sustain me. 3. Tell us more about Juniper + Fir. I started juniper + fir to be able to put into practice my love for home décor and design. I’ve always loved making smaller pieces that allow me to be a part of someone’s home. I dream that in the future I’d be able to bring my work to the next level and create large scale and installation pieces. It sounds like an amazing creative challenge, and one that I’ve been eager to take on. I mainly work with single strand 100% cotton rope. It’s soft and easy to work with and when I have pieces with lots of fringe I find it easier to deal with. Oh my gosh, I couldn’t choose. They are all my favorites at one point or another. I find that when I create something new, I have challenged myself from the previous one and that always becomes my favorite, at least until the next one. 6. How is the yarn scene like in Los Angeles? In the past few years I’ve found that the fiber scene has grown tremendously in LA and elsewhere. Everyone is incredibly talented and we all have our own style, so it doesn’t feel like a competition. We’re all here to support and encourage each other. 7. Is there any interesting or particularly moment in your career as a maker? I can’t say I have any one specific moment. To this day, I’m always super excited when someone orders one of my pieces. I do a little internal celebratory dance because someone wants to purchase something I’ve made with my own hands. Taking on crafting full-time is no small endeavor; you have to give it everything you’ve got. It’s more than a full-time job, so be ready to work harder than you’ve ever worked. If it gets stressful, just remember that every day you get to wake up and create something with your hands, and that beats any day job!